This next man needs no introduction in the bodybuilding world, but I feel it’s necessary to introduce him to you anyway. Jay Cutler is currently one of the big dogs in the weightlifting world. This guy has been at the top of this field for a long time now, and he’s even won some of the most prestigious titles that this industry has to offer. You see, for the longest time, Jay Cutler kept coming in second place to Ronnie Coleman in the Mr. Olympia competition. But something changed in 2006 when he won Mr. Olympia for the first time. He then went on to win the title three more times in 2007, 2009, and 2010. To say that this man knows everything about bodybuilding is an understatement. If you ever wanted to get incredibly big and start living large, Jay Cutler is the man to teach you how to do it. Intrigued? I was, so I bought this program. Here is the best price for all access. What Is Living Large with Jay Cutler All about? This program is designed to develop a body that is large and in charge, and it can happen in as little as eight weeks. The eight-week plan is extraordinary, to say the least, and when it’s all said and done, it’s basically like nothing you’ve ever seen before. Jay Cutler shows an example of his chest workout. The program literally takes you into Jay Cutler’s world. This is truly amazing because it gives you insight into one of the most successful athletes and bodybuilders on the planet. You get to spend an entire week with Jay Cutler in a documentary style. But the program is so much more than that because it goes in depth and shares this weightlifter’s greatest secrets and tools to achieve success. Jay Cutler was a man on a mission in the early 2000’s. As mentioned, he kept losing out and coming in second place to Ronnie Coleman in the Mr. Olympia competition. This was a personal vendetta so to speak that he had with Ronnie Coleman, and he altered his workout routine, among other things, so that he could eventually take the title and wear the crown of Mr. Olympia once and for all. As you learn the methods to Jay Cutler’s madness, you will also have an opportunity to develop a body and muscles just like he has. This can truly become a revolutionary experience for those who have been trying to achieve results with little to no success. Where Do I Begin Living Large with Jay Cutler? Well, the course is laid out simply and very easy to figure out. You’re going to begin at the beginning and watch all of the overview videos. Legacy video – this basically tells you all about Jay Cutler’s legacy, his accomplishments, the ways he trains, and other vital information that will help move you toward success. 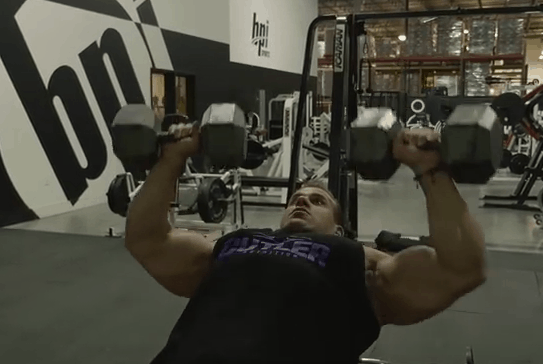 Live large – in the live large overview video, you’ll learn about the life of Jay Cutler. You’ll literally spend an entire week with him and get to see how he goes about his day-to-day life and training. Train large – obviously this video is fairly self-explanatory. It is an overview of all of Jay Cutler’s immense training workouts. With more than 20 years of experience working out, this bodybuilder extraordinaire has a tremendous amount of advice and expertise that he is ready to share with you. Pay close attention to this video. You’ll want to watch it over and over again so that you can absorb all the wisdom that he is sharing with you. This is truly amazing stuff and it could change your life forever for the better. Eat large – again, getting big is a lot more than putting together an exercise routine. You need to fuel your body with the proper food in order to pack on muscle mass. Jay will teach you about the optimal diet that is ideal for building muscle mass. Supplements video – supplements will also play a big part in your success in the bodybuilding world. Without the right supplements, you’ll have a difficult time gaining muscle mass and finding the energy to get through your grueling workouts. Plus there are awesome recovery supplements that you need to know about as well that will help you bounce back from a tough workout in no time at all. Jay Cutler is the man as far as bodybuilding is concerned. Are you ready to learn from the former four-time Mr. Olympia? Join his program today if you’re up for the challenge.